STATE HOUSE, ENTEBBE – President Museveni has said that Local Government Authorities’ together with the Central Government departments in the country are all obliged to agree on common and shared goals for national development and transformation based on available resources. “Local governments should use prioritization approach with the available resources from the current small national tax base and agree on development programmes’ implementation strategy as the best way to go locally and centrally,” he said. 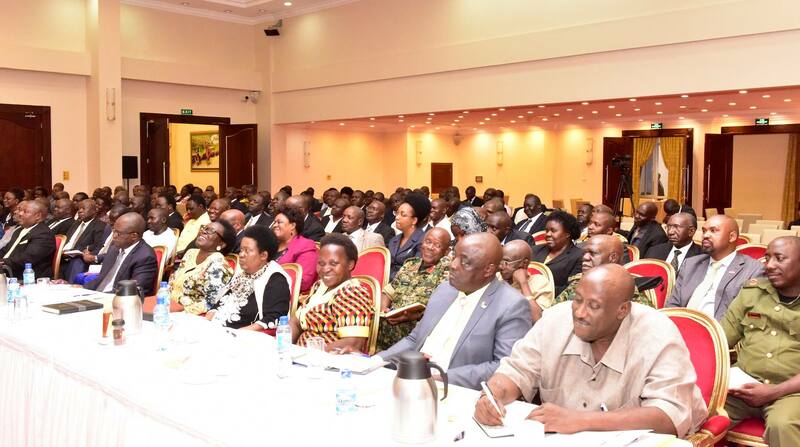 The President made the remarks in a meeting with LC5 Chairpersons from all over the country at State House, Entebbe. It was convened to share knowledge about Central Government programmes and Local Governments’ projects planning, implementation, monitoring and assessment for better and improved service delivery to the grassroots. “We have convened here to recapitulate on the fundamental problems the country faces dating from independence,” the President said. The meeting also included Prime Minister, Dr Ruhakana Rugunda, Cabinet Ministers, Permanent Secretaries, Local Government officials, Operation Wealth Creation (OWC) personnel, and Commissioners among others. The President told the meeting that during his visits to districts in the future, he will not expect any official to speak about the implementation of government programmes in their localities. He informed the meeting that to revive ‘a once dead national economy’ of the 1970s, the NRM Government had to revamp the national recovery programmes by establishing first and foremost peace and stability, building a strong Army, re-introduce the private sector and investment that had collapsed, building the infrastructure, creating the human resource with the necessary education and skills. He said that the measures that the Movement put into place have delivered positive results as is witnessed by the economic development in the country today. The President expressed happiness that the OWC programme, that has been in operation for 2 years, has progressively registered remarkable steps in reducing poverty levels under the management of the National Coordinator, Gen. Salim Saleh and the Uganda People’s Defence Forces (UPDF) field officers, who are all committed to the distribution of agricultural implements and equipment throughout the regions of the country. The Chairperson of the Local Government Finance Commission (LGFC), Dr. Agnes Atim Apea, in a presentation for performance review of fiscal years 2017-2018 and 2018-19, recommended that local government financing strategy should include consolidation of all government programmes and empower them with clear leadership at district level in order to avoid duplication and be allowed to be self-accountable on their equipment and interventions. She further recommended that the 96% of direct local government transfers should be converted from conditional to unconditional grants. The Minister of Local Government, Hon. Tom Butime, who briefed the meeting on key elements of his Ministry, identified some of the challenges to Local Governments including financial constraints for easy service delivery noting that lack of drawing physical presence and attention to programmes at the grassroots are hindrances to making Local Government leaders do a good job. Uganda Local Governments’ Association (ULGA) President, Mr George Mutabaazi, who is also Lwengo District LC 5 Chairperson, revealed that the Association acts as the mouthpiece of Local Government leaders in the country.